For other uses, see Amyloid (disambiguation). Amyloids are aggregates of proteins that become folded into a shape that allows many copies of that protein to stick together, forming fibrils. In the human body, amyloids have been linked to the development of various diseases. Pathogenic amyloids form when previously healthy proteins lose their normal physiological functions and form fibrous deposits in plaques around cells which can disrupt the healthy function of tissues and organs. Such amyloids have been associated with (but not necessarily as the cause of) more than 50 human diseases, known as amyloidoses, and may play a role in some neurodegenerative disorders. Some amyloid proteins are infectious; these are called prions in which the infectious form can act as a template to convert other non-infectious proteins into infectious form. Amyloids may also have normal biological functions; for example, in the formation of fimbriae in some genera of bacteria, transmission of epigenetic traits in fungi, as well as pigment deposition and hormone release in humans. Amyloids have been known to arise from many different proteins and polypeptides. These polypeptide chains generally form β-sheet structures that aggregate into long fibers; however, identical polypeptides can fold into multiple distinct amyloid conformations. The diversity of the conformations may have led to different forms of the prion diseases. Amyloid of HET-s(218-289) prion pentamer, Podospora anserina. The name amyloid comes from the early mistaken identification by Rudolf Virchow of the substance as starch (amylum in Latin, from Greek ἄμυλον amylon), based on crude iodine-staining techniques. For a period, the scientific community debated whether or not amyloid deposits are fatty deposits or carbohydrate deposits until it was finally found (in 1859) that they are, in fact, deposits of albumoid proteinaceous material. The classical, histopathological definition of amyloid is an extracellular, proteinaceous deposit exhibiting beta sheet structure. Common to most cross-beta-type structures, in general, they are identified by apple-green birefringence when stained with congo red and seen under polarized light. These deposits often recruit various sugars and other components such as Serum Amyloid P component, resulting in complex, and sometimes inhomogeneous structures. Recently this definition has come into question as some classic, amyloid species have been observed in distinctly intracellular locations. A more recent, biophysical definition is broader, including any polypeptide that polymerizes to form a cross-beta structure, in vivo or in vitro. Some of these, although demonstrably cross-beta sheet, do not show some classic histopathological characteristics such as the Congo-red birefringence. Microbiologists and biophysicists have largely adopted this definition, leading to some conflict in the biological community over an issue of language. The remainder of this article will use the biophysical context. The International Society of Amyloidosis classifies amyloid fibrils based upon associated proteins. Curli fibrils produced by E. coli, Salmonella, and a few other members of the Enterobacteriales (Csg). The genetic elements (operons) encoding the curli system are phylogenetic widespread and can be found in at least four bacterial phyla. This suggest that many more bacteria may express curli fibrils. "Amyloid deposits occur in the pancreas of patients with diabetes mellitus, although it is not known if this is functionally important. The major component of pancreatic amyloid is a 37-amino acid residue peptide known as islet amyloid polypeptide or amylin. This is stored with insulin in secretory granules in B cells and is co secreted with insulin" (Rang and Dale's Pharmacology, 2015). ATTR amyloid deposits from transthyretin occur not only in Transthyretin-related hereditary amyloidosis, but also in advanced cases of aging in many tissues, in many mammalian species. They are a common result in supercentenarian autopsies. A proposal is that they may mediate some tissue pathologies seen in advanced aging, and pose a limit to human life span. Amyloids are formed of long unbranched fibers that are characterized by a cross-beta sheet quaternary structure in which antiparallel chains of β-stranded peptides are arranged in an orientation perpendicular to the axis of the fiber. Each individual fiber may be 5–15 nanometres in width and a few micrometres in length. While amyloid is usually identified using fluorescent dyes, stain polarimetry, circular dichroism, or FTIR (all indirect measurements), the "gold-standard" test to see whether a structure contains cross-β fibres is by placing a sample in an X-ray diffraction beam. The term "cross-β" was based on the observation of two sets of diffraction lines, one longitudinal and one transverse, that form a characteristic "cross" pattern. There are two characteristic scattering diffraction signals produced at 4.7 and 10 Ångstroms (0.47 nm and 1.0 nm), corresponding to the interstrand and stacking distances in beta sheets. The "stacks" of beta sheet are short and traverse the breadth of the amyloid fibril; the length of the amyloid fibril is built by aligned strands. The cross-beta pattern is considered a diagnostic hallmark of amyloid structure. For a long time our knowledge of the atomic-level structure of amyloid fibrils was limited by the fact that they are unsuitable for the most traditional methods for studying protein structures. Recent years have seen progress in experimental methods that now enable direct data on the internal structure of different types of amyloid fibrils. Two prominent methods include the use of solid-state NMR spectroscopy and (cryo) electron microscopy. Combined, these methods have provided 3D atomic structures of amyloid fibrils formed by amyloid β peptides, α-synuclein, tau, and the FUS protein, associated with various neurodegenerative diseases. X-ray diffraction studies of microcrystals revealed atomistic details of core region of amyloid. The crystallographic structures show that short stretches from amyloid-prone regions of amyloidogenic proteins run perpendicular to the filament axis, consistent with the "cross-β" feature of amyloid structure. They also reveal a number of characteristics of amyloid structures – neighboring β-sheets are tightly packed together via an interface devoid of water (therefore referred to as dry interface), with the opposing β-strands slightly offset from each other such that their side-chains interdigitate. This compact dehydrated interface created was termed a steric-zipper interface. There are eight theoretical classes of steric-zipper interfaces, dictated by the directionality of the β-sheets (parallel and anti-parallel) and symmetry between adjacent β-sheets. Although bona fide amyloid structures always are based on intermolecular β-sheets, different types of "higher order" tertiary folds have been observed or proposed. The β-sheets may form a β-sandwich, or a β-solenoid which may be either β-helix or β-roll. One complicating factor in studies of amyloidogenic polypeptides is that identical polypeptides can fold into multiple distinct amyloid conformations. This phenomenon is typically described as amyloid polymorphism. It has notable biological consequences given that it is thought to explain the prion strain phenomenon, for example. Amyloid is formed through the polymerization of hundreds to thousands of monomeric peptides into long fibers. In general, amyloid polymerization (aggregation or non-covalent polymerization) is sequence-sensitive, that is, causing mutations in the sequence can prevent self-assembly, especially if the mutation is a beta-sheet breaker, such as proline or non-coded alpha-aminoisobutyric acid. For example, humans produce amylin, an amyloidogenic peptide associated with type II diabetes, but in rats and mice prolines are substituted in critical locations and amyloidogenesis does not occur. Studies comparing synthetic to recombinant Amyloid beta 1-42 in assays measuring rate of fibrillation, fibril homogeneity, and cellular toxicity showed that recombinant Amyloid beta 1-42 has a faster fibrillation rate and greater toxicity than synthetic Amyloid beta 1-42 peptide. This observation combined with the irreproducibility of certain Amyloid beta 1-42 experimental studies has been suggested to be responsible for the lack of progress in Alzheimer's research. Consequently, there have been renewed efforts to manufacture Amyloid beta 1-42 and other amyloid peptides at unprecedented (>99%) purity. There are multiple classes of amyloid-forming polypeptide sequences. Glutamine-rich polypeptides are important in the amyloidogenesis of Yeast and mammalian prions, as well as Trinucleotide repeat disorders including Huntington's disease. When glutamine-rich polypeptides are in a β-sheet conformation, glutamines can brace the structure by forming inter-strand hydrogen bonding between its amide carbonyls and nitrogens of both the backbone and side chains. The onset age for Huntington's disease shows an inverse correlation with the length of the polyglutamine sequence, with analogous findings in a C. elegans model system with engineered polyglutamine peptides. Other polypeptides and proteins such as amylin and the Alzheimer's beta protein do not have a simple consensus sequence and are thought to operate by hydrophobic association. Among the hydrophobic residues, aromatic amino-acids are found to have the highest amyloidogenic propensity. For these peptides, cross-polymerization (fibrils of one polypeptide sequence causing other fibrils of another sequence to form) is observed in vitro and possibly in vivo. This phenomenon is important, since it would explain interspecies prion propagation and differential rates of prion propagation, as well as a statistical link between Alzheimer's and type 2 diabetes. In general, the more similar the peptide sequence the more efficient cross-polymerization is, though entirely dissimilar sequences can cross-polymerize and highly similar sequences can even be "blockers" that prevent polymerization. Polypeptides will not cross-polymerize their mirror-image counterparts, indicating that the phenomenon involves specific binding and recognition events. The fast aggregation process, rapid conformational changes as well as solvent effects provide challenges in measuring monomeric and oligomeric amyloid peptide structures in solution. Theoretical and computational studies complement experiments and provide insights that are otherwise difficult to obtain using conventional experimental tools. Several groups have successfully studied the disordered structures of amyloid and reported random coil structures with specific structuring of monomeric and oligomeric amyloid as well as how genetics and oxidative stress impact the flexible structures of amyloid in solution. Oligomeric intermediates of insulin during fibrillation (more toxic than other intermediates: native, protofibril, and fibril) decreased the surface tension of solution which indicated to detergent-like properties of oligomers and significant role of hydrophobic forces in cytotoxicity of oligomers. The reasons for amyloid association disease are unclear. In some cases, the deposits physically disrupt tissue architecture, suggesting disruption of function by some bulk process. An emerging consensus implicates prefibrillar intermediates rather than mature amyloid fibers in causing cell death. Calcium dysregulation has been observed in cells exposed to amyloid oligomers. These small aggregates can form ion channels planar lipid bilayer membranes. Channel formation has been hypothesized to account for calcium dysregulation and mitochondrial dysfunction by allowing indiscriminate leakage of ions across cell membranes. Studies have shown that amyloid deposition is associated with mitochondrial dysfunction and a resulting generation of reactive oxygen species (ROS), which can initiate a signalling pathway leading to apoptosis. There are reports that indicate amyloid polymers (such as those of huntingtin, associated with Huntington's disease) can induce the polymerization of essential amyloidogenic proteins, which should be deleterious to cells. Also, interaction partners of these essential proteins can also be sequestered. In the clinical setting, amyloid diseases are typically identified by a change in the fluorescence intensity of planar aromatic dyes such as thioflavin T, congo red or NIAD-4. In general, this is attributed to the environmental change, as these dyes intercalate between beta-strands to confine their structure. Congo Red positivity remains the gold standard for diagnosis of amyloidosis. In general, binding of Congo Red to amyloid plaques produces a typical apple-green birefringence when viewed under cross-polarized light. Recently, significant enhancement of fluorescence quantum yield of NIAD-4 was exploited to super-resolution fluorescence imaging of amyloid fibrils and oligomers. 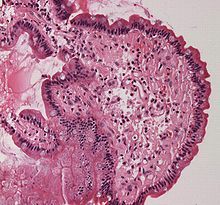 To avoid nonspecific staining, other histology stains, such as the hematoxylin and eosin stain, are used to quench the dyes' activity in other places such as the nucleus, where the dye might bind. Modern antibody technology and immunohistochemistry has made specific staining easier, but often this can cause trouble because epitopes can be concealed in the amyloid fold; in general, an amyloid protein structure is a different conformation from the one that the antibody recognizes. ^ Knowles TP, Vendruscolo M, Dobson CM (June 2014). "The amyloid state and its association with protein misfolding diseases". Nature Reviews. Molecular Cell Biology. 15 (6): 384–96. doi:10.1038/nrm3810. PMID 24854788. ^ Pulawski W, Ghoshdastider U, Andrisano V, Filipek S (April 2012). "Ubiquitous amyloids". Applied Biochemistry and Biotechnology. 166 (7): 1626–43. doi:10.1007/s12010-012-9549-3. PMC 3324686. PMID 22350870. ^ Soto C, Estrada L, Castilla J (March 2006). "Amyloids, prions and the inherent infectious nature of misfolded protein aggregates". Trends in Biochemical Sciences. 31 (3): 150–5. doi:10.1016/j.tibs.2006.01.002. PMID 16473510. ^ a b c d e f Toyama BH, Weissman JS (2011). "Amyloid structure: conformational diversity and consequences". Annual Review of Biochemistry. 80: 557–85. doi:10.1146/annurev-biochem-090908-120656. PMC 3817101. PMID 21456964. ^ Ramirez-Alvarado M, Merkel JS, Regan L (August 2000). "A systematic exploration of the influence of the protein stability on amyloid fibril formation in vitro". Proceedings of the National Academy of Sciences of the United States of America. 97 (16): 8979–84. doi:10.1073/pnas.150091797. PMC 16807. PMID 10908649. ^ Kyle RA (September 2001). "Amyloidosis: a convoluted story". British Journal of Haematology. 114 (3): 529–38. doi:10.1046/j.1365-2141.2001.02999.x. PMID 11552976. ^ Sipe JD, Cohen AS (June 2000). "Review: history of the amyloid fibril". Journal of Structural Biology. 130 (2–3): 88–98. doi:10.1006/jsbi.2000.4221. PMID 10940217. ^ Lin CY, Gurlo T, Kayed R, Butler AE, Haataja L, Glabe CG, et al. (May 2007). "Toxic human islet amyloid polypeptide (h-IAPP) oligomers are intracellular, and vaccination to induce anti-toxic oligomer antibodies does not prevent h-IAPP-induced beta-cell apoptosis in h-IAPP transgenic mice". Diabetes. 56 (5): 1324–32. doi:10.2337/db06-1579. PMID 17353506. ^ Nilsson MR (September 2004). "Techniques to study amyloid fibril formation in vitro". Methods. 34 (1): 151–60. doi:10.1016/j.ymeth.2004.03.012. PMID 15283924. ^ Fändrich M (August 2007). "On the structural definition of amyloid fibrils and other polypeptide aggregates". Cellular and Molecular Life Sciences. 64 (16): 2066–78. doi:10.1007/s00018-007-7110-2. PMID 17530168. ^ Chiang PK, Lam MA, Luo Y (September 2008). "The many faces of amyloid beta in Alzheimer's disease". Current Molecular Medicine. 8 (6): 580–4. doi:10.2174/156652408785747951. PMID 18781964. ^ a b Irvine GB, El-Agnaf OM, Shankar GM, Walsh DM (2008). "Protein aggregation in the brain: the molecular basis for Alzheimer's and Parkinson's diseases". Molecular Medicine. 14 (7–8): 451–64. doi:10.2119/2007-00100.Irvine. PMC 2274891. PMID 18368143. ^ a b Ferreira ST, Vieira MN, De Felice FG (2007). "Soluble protein oligomers as emerging toxins in Alzheimer's and other amyloid diseases". IUBMB Life. 59 (4–5): 332–45. doi:10.1080/15216540701283882. PMID 17505973. ^ Hamley IW (October 2012). "The amyloid beta peptide: a chemist's perspective. Role in Alzheimer's and fibrillization". Chemical Reviews. 112 (10): 5147–92. doi:10.1021/cr3000994. PMID 22813427. ^ Haataja L, Gurlo T, Huang CJ, Butler PC (May 2008). "Islet amyloid in type 2 diabetes, and the toxic oligomer hypothesis". Endocrine Reviews. 29 (3): 303–16. doi:10.1210/er.2007-0037. PMC 2528855. PMID 18314421. ^ Höppener JW, Ahrén B, Lips CJ (August 2000). "Islet amyloid and type 2 diabetes mellitus". The New England Journal of Medicine. 343 (6): 411–9. doi:10.1056/NEJM200008103430607. PMID 10933741. ^ "More than just mad cow disease". Nature Structural Biology. 8 (4): 281. April 2001. doi:10.1038/86132. PMID 11276238. ^ Truant R, Atwal RS, Desmond C, Munsie L, Tran T (September 2008). "Huntington's disease: revisiting the aggregation hypothesis in polyglutamine neurodegenerative diseases". The FEBS Journal. 275 (17): 4252–62. doi:10.1111/j.1742-4658.2008.06561.x. PMID 18637947. ^ Weydt P, La Spada AR (August 2006). "Targeting protein aggregation in neurodegeneration--lessons from polyglutamine disorders". Expert Opinion on Therapeutic Targets. 10 (4): 505–13. doi:10.1517/14728222.10.4.505. PMID 16848688. ^ a b "Amyloidosis: Definition of Amyloid and Amyloidosis, Classification Systems, Systemic Amyloidoses". 10 October 2018 – via eMedicine. ^ Dotti CG, De Strooper B (February 2009). "Alzheimer's dementia by circulation disorders: when trees hide the forest". Nature Cell Biology. 11 (2): 114–6. doi:10.1038/ncb0209-114. PMID 19188916. ^ Sipe JD, Benson MD, Buxbaum JN, Ikeda S, Merlini G, Saraiva MJ, Westermark P (September 2010). "Amyloid fibril protein nomenclature: 2010 recommendations from the nomenclature committee of the International Society of Amyloidosis". Amyloid. 17 (3–4): 101–4. doi:10.3109/13506129.2010.526812. PMID 21039326. ^ Hammer ND, Wang X, McGuffie BA, Chapman MR (May 2008). "Amyloids: friend or foe?". Journal of Alzheimer's Disease. 13 (4): 407–19. PMC 2674399. PMID 18487849. Archived from the original on 2013-01-03. ^ Dueholm MS, Albertsen M, Otzen D, Nielsen PH (2012). Webber MA (ed.). "Curli functional amyloid systems are phylogenetically widespread and display large diversity in operon and protein structure". PLOS One. 7 (12): e51274. doi:10.1371/journal.pone.0051274. PMC 3521004. PMID 23251478. ^ Bayro MJ, Daviso E, Belenky M, Griffin RG, Herzfeld J (January 2012). "An amyloid organelle, solid-state NMR evidence for cross-β assembly of gas vesicles". The Journal of Biological Chemistry. 287 (5): 3479–84. doi:10.1074/jbc.M111.313049. PMC 3271001. PMID 22147705. ^ Dueholm MS, Petersen SV, Sønderkær M, Larsen P, Christiansen G, Hein KL, Enghild JJ, Nielsen JL, Nielsen KL, Nielsen PH, Otzen DE (August 2010). "Functional amyloid in Pseudomonas". Molecular Microbiology. 77 (4): 1009–20. doi:10.1111/j.1365-2958.2010.07269.x. PMID 20572935. ^ Dueholm MS, Søndergaard MT, Nilsson M, Christiansen G, Stensballe A, Overgaard MT, Givskov M, Tolker-Nielsen T, Otzen DE, Nielsen PH (June 2013). "Expression of Fap amyloids in Pseudomonas aeruginosa, P. fluorescens, and P. putida results in aggregation and increased biofilm formation". MicrobiologyOpen. 2 (3): 365–82. doi:10.1002/mbo3.81. PMC 3684753. PMID 23504942. ^ Maji SK, Perrin MH, Sawaya MR, Jessberger S, Vadodaria K, Rissman RA, Singru PS, Nilsson KP, Simon R, Schubert D, Eisenberg D, Rivier J, Sawchenko P, Vale W, Riek R (July 2009). "Functional amyloids as natural storage of peptide hormones in pituitary secretory granules". Science. 325 (5938): 328–32. doi:10.1126/science.1173155. PMC 2865899. PMID 19541956. ^ Bongiovanni MN, Scanlon DB, Gras SL (September 2011). "Functional fibrils derived from the peptide TTR1-cycloRGDfK that target cell adhesion and spreading". Biomaterials. 32 (26): 6099–110. doi:10.1016/j.biomaterials.2011.05.021. PMID 21636126. ^ Larsen P, Nielsen JL, Dueholm MS, Wetzel R, Otzen D, Nielsen PH (December 2007). "Amyloid adhesins are abundant in natural biofilms". Environmental Microbiology. 9 (12): 3077–90. doi:10.1111/j.1462-2920.2007.01418.x. PMID 17991035. ^ Garcia MC, Lee JT, Ramsook CB, Alsteens D, Dufrêne YF, Lipke PN (March 2011). "A role for amyloid in cell aggregation and biofilm formation". PLOS One. 6 (3): e17632. doi:10.1371/journal.pone.0017632. PMC 3050909. PMID 21408122. ^ Lipke PN, Garcia MC, Alsteens D, Ramsook CB, Klotz SA, Dufrêne YF (February 2012). "Strengthening relationships: amyloids create adhesion nanodomains in yeasts". Trends in Microbiology. 20 (2): 59–65. doi:10.1016/j.tim.2011.10.002. PMC 3278544. PMID 22099004. ^ Dueholm MS, Larsen P, Finster K, Stenvang MR, Christiansen G, Vad BS, Bøggild A, Otzen DE, Nielsen PH (August 2015). "The Tubular Sheaths Encasing Methanosaeta thermophila Filaments Are Functional Amyloids". The Journal of Biological Chemistry. 290 (33): 20590–600. doi:10.1074/jbc.M115.654780. PMC 4536462. PMID 26109065. ^ Wormell RL. New fibres from proteins. Academic Press, 1954, p. 106. ^ Sunde M, Serpell LC, Bartlam M, Fraser PE, Pepys MB, Blake CC (October 1997). "Common core structure of amyloid fibrils by synchrotron X-ray diffraction". Journal of Molecular Biology. 273 (3): 729–39. doi:10.1006/jmbi.1997.1348. PMID 9356260. ^ Meier BH, Riek R, Böckmann A (October 2017). "Emerging Structural Understanding of Amyloid Fibrils by Solid-State NMR". Trends in Biochemical Sciences. 42 (10): 777–787. doi:10.1016/j.tibs.2017.08.001. PMID 28916413. ^ Fitzpatrick AW, Falcon B, He S, Murzin AG, Murshudov G, Garringer HJ, Crowther RA, Ghetti B, Goedert M, Scheres SH (July 2017). "Cryo-EM structures of tau filaments from Alzheimer's disease". Nature. 547 (7662): 185–190. doi:10.1038/nature23002. PMC 5552202. PMID 28678775. ^ Nelson R, Sawaya MR, Balbirnie M, Madsen AØ, Riekel C, Grothe R, Eisenberg D (June 2005). "Structure of the cross-beta spine of amyloid-like fibrils". Nature. 435 (7043): 773–8. doi:10.1038/nature03680. PMC 1479801. PMID 15944695. ^ Sawaya MR, Sambashivan S, Nelson R, Ivanova MI, Sievers SA, Apostol MI, Thompson MJ, Balbirnie M, Wiltzius JJ, McFarlane HT, Madsen AØ, Riekel C, Eisenberg D (May 2007). "Atomic structures of amyloid cross-beta spines reveal varied steric zippers". Nature. 447 (7143): 453–7. doi:10.1038/nature05695. PMID 17468747. ^ Gilead S, Gazit E (August 2004). "Inhibition of amyloid fibril formation by peptide analogues modified with alpha-aminoisobutyric acid". Angewandte Chemie. 43 (31): 4041–4. doi:10.1002/anie.200353565. PMID 15300690. ^ Finder VH, Vodopivec I, Nitsch RM, Glockshuber R (February 2010). "The recombinant amyloid-beta peptide Abeta1-42 aggregates faster and is more neurotoxic than synthetic Abeta1-42". Journal of Molecular Biology. 396 (1): 9–18. doi:10.1016/j.jmb.2009.12.016. PMID 20026079. ^ "State of aggregation". Nature Neuroscience. 14 (4): 399. April 2011. doi:10.1038/nn0411-399. PMID 21445061. ^ Morley JF, Brignull HR, Weyers JJ, Morimoto RI (August 2002). "The threshold for polyglutamine-expansion protein aggregation and cellular toxicity is dynamic and influenced by aging in Caenorhabditis elegans". Proceedings of the National Academy of Sciences of the United States of America. 99 (16): 10417–22. doi:10.1073/pnas.152161099. PMC 124929. PMID 12122205. ^ Gazit E (January 2002). "A possible role for pi-stacking in the self-assembly of amyloid fibrils". FASEB Journal. 16 (1): 77–83. doi:10.1096/fj.01-0442hyp. PMID 11772939. ^ Pawar AP, Dubay KF, Zurdo J, Chiti F, Vendruscolo M, Dobson CM (July 2005). "Prediction of "aggregation-prone" and "aggregation-susceptible" regions in proteins associated with neurodegenerative diseases". Journal of Molecular Biology. 350 (2): 379–92. doi:10.1016/j.jmb.2005.04.016. PMID 15925383. ^ Jackson K, Barisone GA, Diaz E, Jin LW, DeCarli C, Despa F (October 2013). "Amylin deposition in the brain: A second amyloid in Alzheimer disease?". Annals of Neurology. 74 (4): 517–26. doi:10.1002/ana.23956. PMC 3818462. PMID 23794448. ^ Wise-Scira O, Xu L, Kitahara T, Perry G, Coskuner O (November 2011). "Amyloid-β peptide structure in aqueous solution varies with fragment size". The Journal of Chemical Physics. 135 (20): 205101. doi:10.1063/1.3662490. PMID 22128957. ^ Kachooei E, Moosavi-Movahedi AA, Khodagholi F, Ramshini H, Shaerzadeh F, Sheibani N (July 2012). "Oligomeric forms of insulin amyloid aggregation disrupt outgrowth and complexity of neuron-like PC12 cells". PLOS One. 7 (7): e41344. doi:10.1371/journal.pone.0041344. PMC 3407202. PMID 22848469. ^ Demuro A, Mina E, Kayed R, Milton SC, Parker I, Glabe CG (April 2005). "Calcium dysregulation and membrane disruption as a ubiquitous neurotoxic mechanism of soluble amyloid oligomers". The Journal of Biological Chemistry. 280 (17): 17294–300. doi:10.1074/jbc.M500997200. PMID 15722360. ^ Kagan BL, Azimov R, Azimova R (November 2004). "Amyloid peptide channels". The Journal of Membrane Biology. 202 (1): 1–10. doi:10.1007/s00232-004-0709-4. PMID 15702375. ^ Kadowaki H, Nishitoh H, Urano F, Sadamitsu C, Matsuzawa A, Takeda K, et al. (January 2005). "Amyloid beta induces neuronal cell death through ROS-mediated ASK1 activation". Cell Death and Differentiation. 12 (1): 19–24. doi:10.1038/sj.cdd.4401528. PMID 15592360. ^ Kochneva-Pervukhova NV, Alexandrov AI, Ter-Avanesyan MD (2012). Tuite MF (ed.). "Amyloid-mediated sequestration of essential proteins contributes to mutant huntingtin toxicity in yeast". PLOS One. 7 (1): e29832. doi:10.1371/journal.pone.0029832. PMC 3256205. PMID 22253794. ^ Nesterov EE, Skoch J, Hyman BT, Klunk WE, Bacskai BJ, Swager TM (August 2005). "In vivo optical imaging of amyloid aggregates in brain: design of fluorescent markers". Angewandte Chemie. 44 (34): 5452–6. doi:10.1002/anie.200500845. PMID 16059955. ^ Bae S, Lim E, Hwang D, Huh H, Kim SK (2015). "Torsion-dependent fluorescence switching of amyloid-binding dye NIAD-4". Chemical Physics Letters. 633: 109–13. doi:10.1016/j.cplett.2015.05.010. ^ Ries J, Udayar V, Soragni A, Hornemann S, Nilsson KP, Riek R, Hock C, Ewers H, Aguzzi AA, Rajendran L (July 2013). "Superresolution imaging of amyloid fibrils with binding-activated probes". ACS Chemical Neuroscience. 4 (7): 1057–61. doi:10.1021/cn400091m. PMC 3715833. PMID 23594172. ^ Huh H, Lee J, Kim HJ, Hohng S, Kim SK (2017). "Morphological analysis of oligomeric vs. fibrillar forms of α-synuclein aggregates with super-resolution BALM imaging". Chemical Physics Letters. 690: 62–67. doi:10.1016/j.cplett.2017.10.034. Wikimedia Commons has media related to Amyloid.